Several years ago when I was in Delhi, India, I visited the dargah (shrine) of the mystic Hazrat Iniyat Khan (1882-1927) who is credited as helping to bring Sufism to the west. I was struck by the beauty of the surroundings — especially this carved marble wall screen made up predominantly of pentagons. I took great delight in this pattern, and spend a good fifteen minutes sitting next to it studying it. I found it quite soothing. You might take a moment to check out the different pentagons and the patterns they make. Question: I'm currently working on a project that involves the pentagon shape. If you feel like sharing, I'd love to hear your favorite ways pentagons are used, either in nature or in human-made constructions. Perhaps you have a pentagon story. "The world's cleverest designers cater to the globe's richest 10 per cent, creating items like wine labels, couture, and Maseratis. We need a revolution to reverse this silly ratio." So says Dr. Paul Polak who runs International Development Enterprises, an organization helping poor farmers become entrepreneurs. Cooper-Hewitt National Design Museum is currently hosting an exhibit called "Design for the Other 90%" (running through September 23). On display are inventions that are designed to help poor people with their very basic needs. A number of these inventions deal with water: procuring water, getting clean drinking water, and getting water in the dry season for drip irrigation. Shown at left (photo: P.J. Hendrikse) is the Q-Drum which is a circular jerry can that holds 20 gallons of water. It rolls so smoothly that a child can easily tow it on a rope. The Q-Drum is designed to change the way water is fetched; currently this backbreaking job is usually done by women and girls who balance water cans on their heads. This looks like quite an improvement. Another invention is the Lifestraw (photo: Vestergaard Frandsen). This drinking filter kills bacteria as water is sucked through it. Since a significant portion of the world's population does not have access to safe and clean drinking water, the Lifestraw is a boon for preventing waterborne diseases. I recommend viewing this video from India to see a lively demonstration of the Lifestraw in action. More inventions are cited and displayed at the above Cooper-Hewitt link. Also, check out Donald McNeil's article "Design that solves problems for the world's poor" in the May 29, 2007 New York Times. 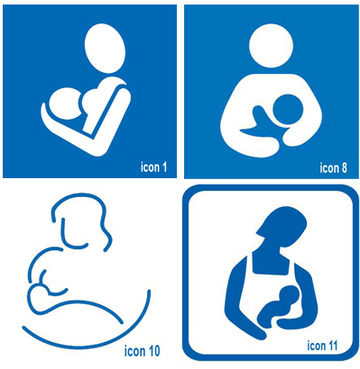 Update: With Mother's Day soon approaching, I thought I'd update one of my first posts: it's about a design contest for breastfeeding icons. Here is the original post. I'll name the winner at the end. You be the Judge! If you've ever created an icon or logo, you know that you want your design to be recognizable, memorable, and simple. There's a delicate balance between providing enough information to make your idea recognizable, but not having so much that the concept you're trying to communicate gets lost. In addition, having your design work at many different sizes is important. Mothering, the natural family living magazine, decided to have a "Create a Breastfeeding Icon" contest. The image of a baby bottle on an airport sign announcing the location of a "parents lounge" infuriated us and got us thinking: Isn't there an international symbol for breastfeeding? We called around. Spoke to lactivists and breastfeeding organizations all over the world. No one had seen or heard of an international symbol for breastfeeding. This is our official call for entries. They received over 500 entries, and narrowed it down to twelve finalists. I've selected my favorite four icons (shown below). Voting just ended and the winner will be announced soon. Okay, icon judges: Which do you think best does the job? Which would you like to see in an airport? Among the many entries were some that, as the editors put it, "made us smile." Again I've selected my four favorites. What do you think? Would you want to see any of these at an airport? Do they (unintentionally) communicate another message? The winner according to Mothering is icon 8 (above) created by Matt Daigle, a graphic designer, stay-at-home father and self-described "Mr. Mom." Congratulations Matt! Interesting side note: Matt is a deaf cartoonist. Check out his site for his take on what he thinks is funny in the "deaf world." Any thoughts? Which icon would you have selected? Shown at left is Lang's origami piece called "Mt. Diablo Spider," made from one uncut 7" square piece of paper. Amazing. The crease and fold pattern Lang meticulously designed to make this shape is shown below. Lang has a master's in electrical engineering from Stanford and a Ph.D. from Caltech in applied physics, and also holds 80 patents. But seven years ago, he left his profession to devote himself full-time to his life long passion, origami. To view some of Lang's origami art constructions, go to his website. Many of these are available for sale. There is also a discussion about the science and mathematics involved in origami. I'm a big advocate of taking expertise from one field and applying it to another. On this score, Lang does not disappoint; he still does some part-time consulting for industry. But Lang's current assignments involve "folding" and packaging rather than physics. According to Orlean, "One medical manufacturer hired him to figure out how to fold a heart implant — a mesh heart support system for people with congestive heart failure — so that it was compact enough to be implanted via a skinny tube but, when released from the tube, would unfurl properly around the heart." A recent project had Lang working on a similar problem: compactly folding a telescope with a 100 meter diameter lens into a shape small enough so that it could be packed into a rocket and sent into space. Question: Think of one of your hobbies or side interests. What skills or knowledge from it can you apply to a current problem? What do you discover? In my recent post "Waking Up With the Goldberg Variations," I described the joy I've been experiencing listening to this set of 32 short pieces written by J.S. Bach. One of the neat things about the blogosphere is that I got to hear from a number of people (either through their comments or private emails) who also enjoy this work. I'd like to point to two of these. The first is Yuzu, who describes herself as a "self-taught hobbyist." She did the above pencil-drawing of Bach. She has also done drawings of many artists — including two of Glenn Gould — which you can see by visiting her site On Nocturnal Avenue 2. It's good stuff! The other is Jorge Camoes, who is an "information visualization" professional. He challenged me to check out Uri Caine's "very personal" rendition of the "Goldberg Variations." I bought a copy, and I can report back to you that it's wonderfully inventive and playful. I think that Bach would really get a kick out of it. It consists of 70 different pieces that include: single harpsichord, choral ensemble, jazz trio, spoken word poems, and so on. Uri Caine has given me a lot of enjoyment. Thanks for the recommendation, Jorge. 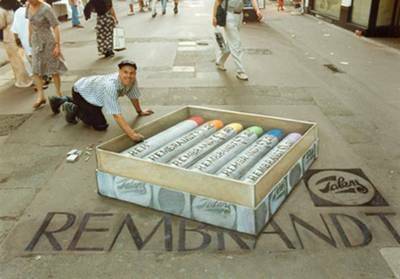 Recently my daughter, Athena, sent me some more examples from the English, Belgium-based artist Julian Beever. Beever is a master of trompe l'oeil (visual deception in painting). I call what he does "Eye Foolery" and you can go to my previous posts for more information on this subject: Fooling the Eye and More Eye-Foolery. 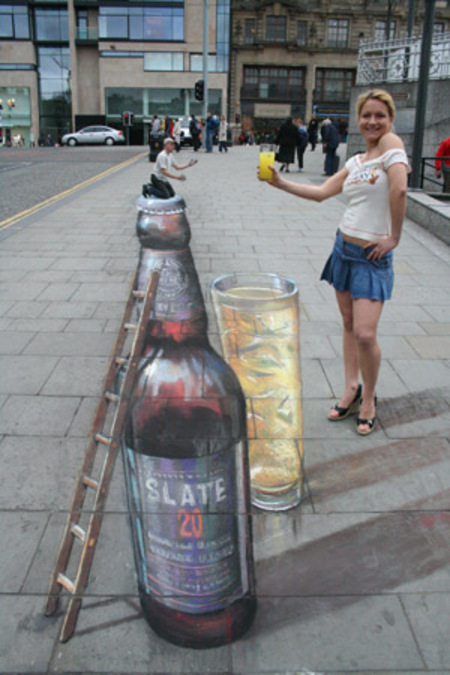 I'm especially taken by Beever's chalked street paintings that use the technique anamorphosis. (Anamorphic illusions are drawn in a special distortion in order to create an impression of three dimensions when seen from one particular viewpoint.) This is Julian's site; check him out. Lots o'fun! Remember when you were in high school and you fell in love with a particular song, and you wanted to hear that song every day for a month or perhaps two? And every time you heard it, it made you feel really, really good? Remember that? Well that's what's happened to me for the past two months with J.S. Bach's Goldberg Variations — in my opinion (and many others) one of the greatest pieces of music ever written (1742). "Lectures 29–32 deal with the Goldberg Variations, probably the most singularly unified, most spiritually esoteric work created during the Baroque. In this intimate keyboard work, consisting of a theme, 30 variations, and a reprise of the theme, worlds of numerical, religious, and metaphysical symbolism have been found. The Goldberg Variations is a work of almost unbelievable substance, a whole infinitely greater than its 32 constituent parts." There is a wonderful complexity to the Goldberg Variations that I've been slowly penetrating. All I know is that every time I listen to this piece, I feel better than when I started! I especially like the ten canons. I own three recordings of the Goldberg Variations, two by pianist Glenn Gould and one by the great Polish harpischordist Wanda Landowska. My favorite is the legendary first Glenn Gould version (recorded when he was 22 years old in 1955); it's full on energy and sparkling clarity. I also like his second version made in 1981 just before his death (it's slower and more introspective). Would you like to hear samples of the Goldberg Variations? Go here to hear! But even better than that is this video I discovered of Glenn Gould playing almost the entire work. It looks as though it were made around 1981 (shortly before his death). It's 47 minutes long. I've watched it three times. You can clearly see a great artist lovingly playing a great work of art. His fingerwork is a sight to behold. [If you don't want to watch it, you might try just having it play in the background. Even better is getting the CD.] Have fun! I'd be curious to hear your recollections and/or feelings about the Goldberg Variations. Also, if there's a piece of classical music that really moves you, I'd like to hear about it as well! The "Annual Year In Ideas" issue of the New York Times Magazine just came out. It contains 74 provocative and sometimes offbeat articles with such titles as "Misery Chic," "The Comb that Listens," "Salt that Doesn't Stick," and "Empty Stomach Intelligence." "Public art projects are usually intended to beautify. But artwork commissioned this summer by the city of Cambridge, Mass., has a more utilitarian goal: reducing traffic speeds at a busy intersection." 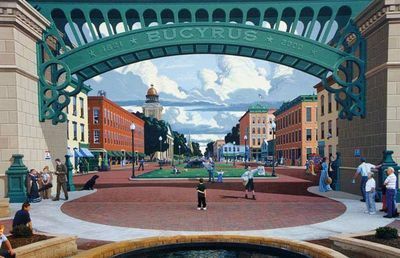 "Soon the city was taking proposals for a circular mural, 20 feet in diameter, to be painted on the asphalt in the center of the intersection — a kind of artwork rotary. The objective, to reduce average speeds from 30 miles per hour to 25, seems relatively modest, but Rasmussen, citing statistics, says it’s significant: 'The chance that a pedestrian would survive an accident is vastly greater at that speed.'" A composition by local artist Wen-ti Tsen was selected (shown in the photo above). Tsen played with several ideas including a trompe l'oeil pothole, but ultimately decided on "something like a blue pond with geometric vegetation in it." Tsen was paid $10,000, a sum significantly less than what traditional "traffic calming" solutions such as speed bumps, raised crosswalks, and traffic "furniture" cost. A "Creative Think Hat-Tip" to Susanne Rasmussen for seeing an idea in one area, and using it as an innovative and practical solution to a different problem. In the recent Fooling the Eye post, I discussed the trompe o'oeil (visual deception in painting) work of Washington muralist Eric Grohe. The eminent orthopedic surgeon, David Caldwell of Sante Fe, has put me on to another wonderful artist who engages in this business of what I call "eye-foolery." 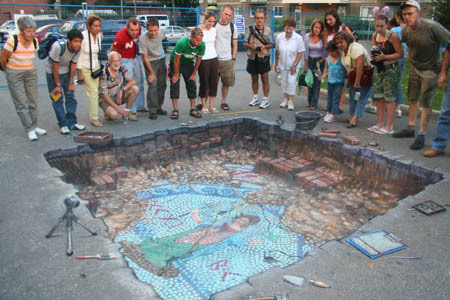 That artist is the English, Belgium-based Julian Beever. 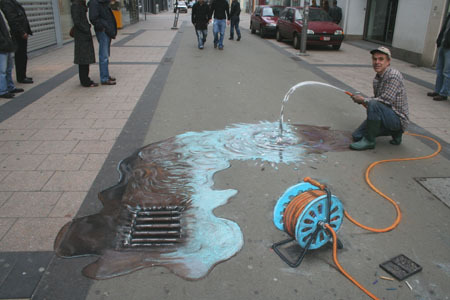 I'm especially taken by Beever's street paintings that use the technique anamorphosis. (Anamorphic illusions are drawn in a special distortion in order to create an impression of three dimensions when seen from one particular viewpoint.) This is Julian's site; check him out. I've included a few of his paintings; his site has many more. 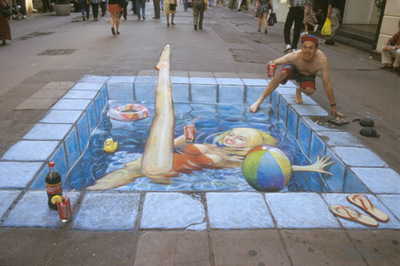 Again, all of these images are two-dimensions painted right on the street! Have fun viewing them. I sure did.